NEW HAVEN – At this year’s New York State Fair, New York grown and produced food and beverage products will be sampled and sold as a part of the exciting “Taste NY” experience. A Taste NY Trail will guide visitors throughout the fairgrounds as they taste, sample and judge a variety of New York made products from wine and beer to maple and dairy to fresh fruits and vegetables. 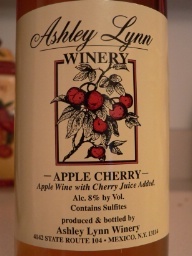 Apply Cherry wine produced and bottled by Ashley Lynn Wineries. Leon’s Farm Market and Ashley Lynn Winery out of New Haven will be actively involved throughout the “Taste NY” experience. The winery will host a wine seminar and their products will be available in wine slushies and popular bottles. The local winery is a part of Hurlbut Orchards which is a family run farm by Leroy, Pat and sons, Leon and Craig Hurlbut. The farm is a top producer of Macintosh and Cortland apples and has been concentrating their efforts on 11 blended varieties of apple wines. Some unique flavors include apple white grape, pomegranate passion and apple cranberry. Their top three bottles sold include Raspberry Rush, Peachy Keen and Elderberry Mist. The wine seminar hosted by Ashley Lynn Winery will include presentations on recognizing the characteristics of New York State wines such as color, nose, flavor and finish. The seminar will also include some of the best New York cheeses to determine the best pairing of the two. There will be 11 days of different wine and cheese seminars which are open to the public. Ashley Lynn Winery’s seminar will be on August 26 at 2:30 p.m. and 5:30 p.m.
To guarantee a seat for any of these free seminars, pre-register call (315) 487-7711, 1135. The New York State Fair runs from August 22 – September 2. Advance sale tickets that save 40 percent off the cost of admission are available statewide. Visit for www.nysfair.org/buy-tickets/advance-sale-tickets for a full list of locations.